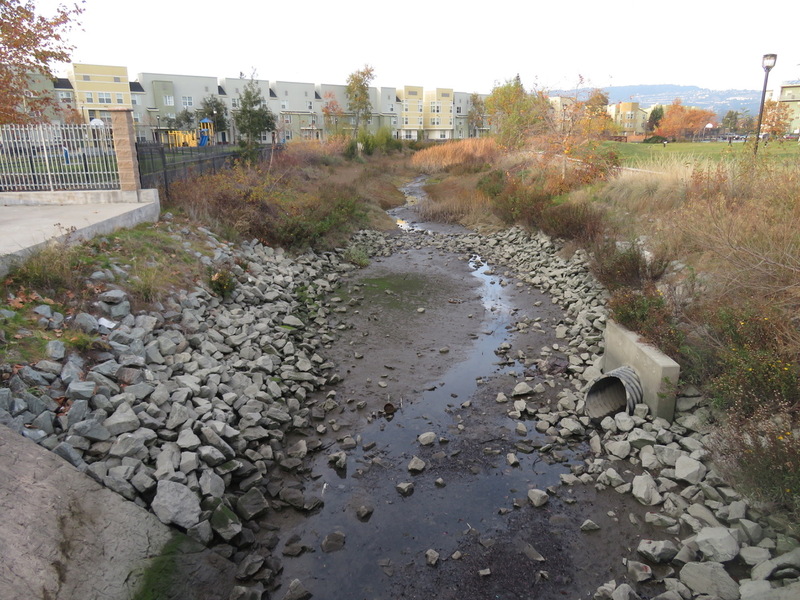 Damon Slough, a 25-foot wide canal of sluggish brown water skirting the Oakland Coliseum’s northern parking lot, is easy to overlook. The slough rises and ebbs underneath the feet of A’s fans as they cross the pedestrian bridge from BART’s Coliseum station to the ballpark. Below the bridge, amid the smell of warm churros and murmur of voices selling scalped tickets, the slough’s straightened concrete channel runs north along the railroad tracks, passing rusty sheet metal warehouses and barbed wire-fenced gravel lots before elbowing west around the Coliseum parking lot. A few blocks away Amtrak riders heading up and down state, and the drivers of big-rigs and sedans on Interstate 880, whiz by mere feet above the slough’s oil-slicked chocolate water and bobbing plastic. With sea levels rising, flooding may force these thousands of commuters to pay attention to Damon Slough soon enough. As tides from the San Francisco Bay push further and further into the slough, water will creep closer and closer to the Coliseum area and the transportation serving it. But water won’t just be coming from the Bay. It will also be coming, as it already does, from the hills, gathering heft as rain falls into creeks and channels and runs through the Oakland flats before dumping into the slough. 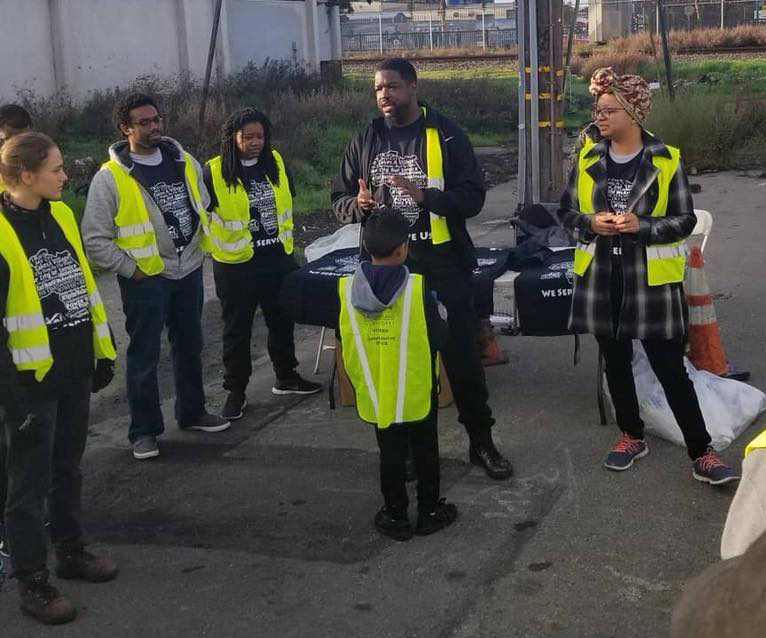 When Marquita Price, the East Oakland Collective’s Urban and Regional Planning Officer, looks at Damon Slough, however, she doesn’t see flood vulnerable trains or freeways. “I see people!” she laughs. The thoughtful, dreadlocked East Oakland native with a steady gaze and big smile is doing her best to help her community address two issues she sees as closely intertwined: East Oakland’s present-day struggle to survive and its future resilience. Despite being several years into a massive redevelopment plan for the Coliseum area, the community, the city, and those concerned with protecting the region’s highways and railroads are just beginning to understand how flooding may influence the future of the area surrounding Damon Slough. Recent research confirms that flooding is coming to the Coliseum area. Which raises the question, how can we protect communities already in the path of redevelopment and gentrification from rising water? The mouth of Damon Slough, where it enters San Leandro Bay and the Oakland Estuary. Damon Slough was named for Nathaniel Damon who had established a rudimentary settlement and boat landing there by 1853. As California’s gold rush spurred development along the east bay, Damon’s “East Creek Slough” landing allowed him to ferry goods to and from San Francisco. While the settlement did not survive into the modern era, the name did. Photo: Isaac Pearlman. What Makes Your House and Your Community Stronger and Safer? Price is steeped in East Oakland’s history, and will tell you about how Huey Newton and Bobby Seale’s Black Panther Party energized Oakland in the 1960s around Malcolm X and Marcus Garvey’s ideas of self-determination and black economics; and then how later the war on drugs and the crack epidemic of the 1980s changed whole communities, snuffing out black-owned businesses. She can recount the area’s record of redlining and housing discrimination, and about the socio-economic divide and tension between those in the East Oakland “flats” and those in the hills. “My great, great grandmother was one of the first black people able to buy a house in East Oakland, and only because her white employer vouched for her,” she says. 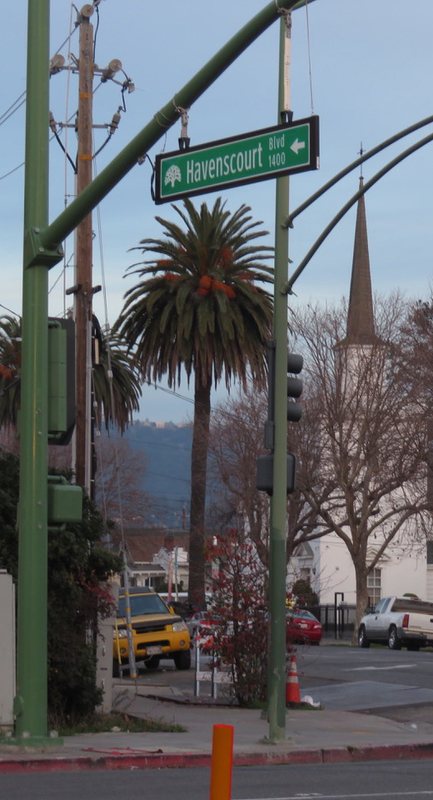 Polluting industries like General Electric, which used to be on International Boulevard and 54th, were a big reason those who could afford to moved to the Oakland hills or Piedmont. “People in the flatlands like deep East Oakland have a sense of being viewed as less important, or not as good, as those in the hills or [even as] just savage,” she says. These historical inequities add up to a serious toll today. Price notes those living in the East Oakland flats can expect to live 10 years less than those living just 1.3 miles away in the Oakland hills, according to recent city resilience assessments. These past issues flow into the present challenges facing East Oakland today: displacement and gentrification, access to basic services, and a lack of power in local decisions as Oakland as a whole rapidly rises in wealth and investment. But sea level rise is a problem rooted in the area’s future, not its past. And making the case to address the concerns of tomorrow in the face of the community’s obvious current needs is a huge hurdle. Walk around East Oakland’s Havenscourt area on a sunny Saturday, and you may see hordes of kids playing soccer and basketball at Lion Creek Park. Around them, young parents bustle in and out of the surrounding Lion Creek Crossing public housing project, while clusters of men chat in stores and on street corners. Nearby, teachers and staff put in long hours at Lockwood and Woodland Elementary Schools. These people are the backbone of the community – yet they are also among those who could suffer the most in the event of a flood. Though people in a particular area may all experience the same flood, the reality is that individuals, families, and communities often vary widely in their ability to respond and recover. Whether you own a car, or don’t speak English, or struggle to pay rent every month, can make the difference between temporary displacement or being deeply uprooted by a disaster. In 2015, experts mapped out these “indicators of flood-risk” for households and communities in the Bay Area and noticed that several communities kept popping up again and again, like a vulnerability heat map. When and Where is the Water Going to Come From? Havenscourt, Eastmont, and Columbia Gardens – all East Oakland communities clustered around the Coliseum and Damon Slough — not only check multiple boxes on the disaster risk list, they also qualify for another vulnerability indicator: they are predominantly black and Latino. And, according to the 2015 research, this characteristic alone means they would be hurt more by flooding than other communities. In combination with all the other factors, it also means these East Oakland neighborhoods are some of the most vulnerable in the San Francisco Bay Area. 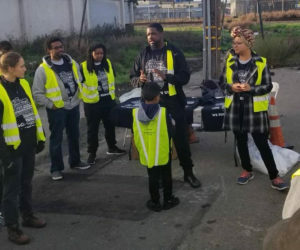 East Oakland Collective volunteers huddle before cleaning and servicing the homeless encampment on the industrial dead end of 77th Avenue (a few blocks from the Coliseum BART station in the flood zone). Photo courtesy EOC. A cursory look at the rise in water levels estimated for the area shows that there isn’t much to be scared of. By 2050 and even 2100, just a small amount of flooding is anticipated around the Coliseum. But Coliseum area communities, in addition to a concentration of vulnerable people, have something else that other areas don’t: Damon Slough and its tributaries – Lion Creek and Arroyo Viejo. Areas where rivers and creeks meet the Bay are particular trouble spots for flooding, since high tides push up into creeks and channels and raise water levels. Most of the time, as soon as the tide goes out the creek lowers back down. But when high tides coincide with a storm, tidal waters traveling up creeks meet stormwater travelling down, resulting in what engineers call a “combined” flood event. Damon Slough is one of the few places in the region where planners have a clear picture of how this double whammy of water (storms plus high tides boosted by sea level rise) increases the possibility of devastation. 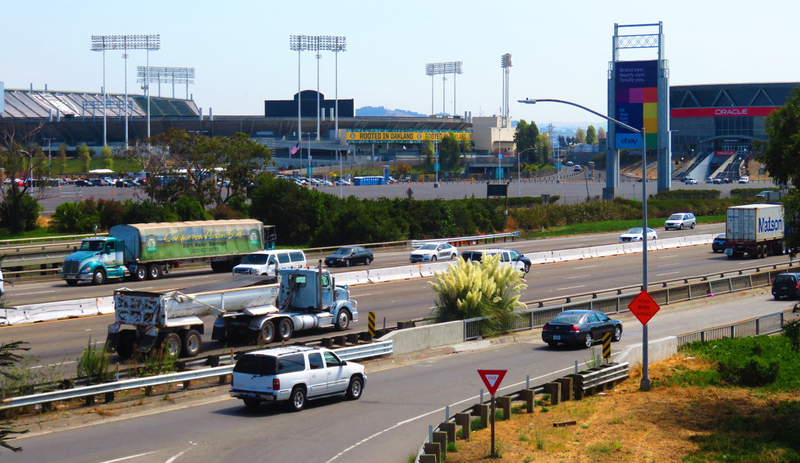 A 2014 study by the Metropolitan Transportation Commission (MTC) found that resulting flooding could overflow the slough channel, sweep over large swaths of the Coliseum complex, engulf water-sensitive underground utilities and electrical components for BART and Amtrak, and even shut down the I-880 freeway or the BART Oakland Airport connector. Although the MTC report focuses on transportation, its future flood maps hint at a bigger problem: an alarming concentration of vulnerable people and houses in the Coliseum area sitting atop aging concrete channels and storm drains not designed with a rising Bay, let alone a combined flood event, in mind. 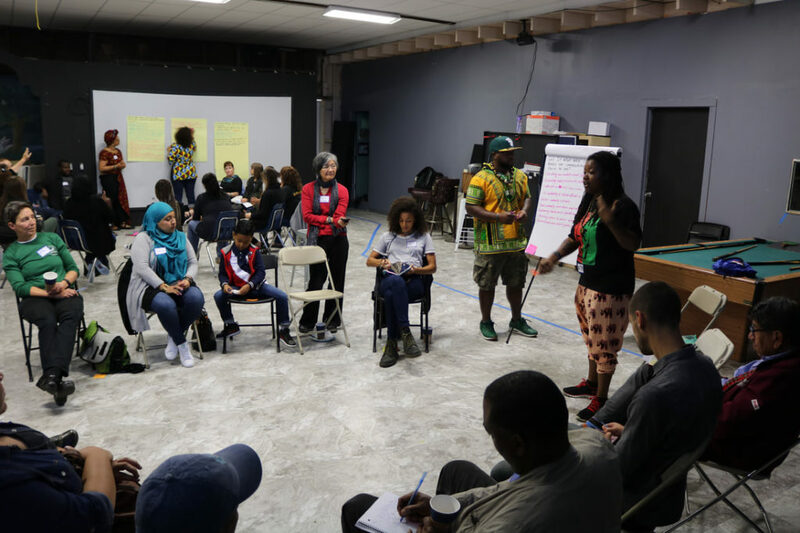 In the short term, providing the community with resources for organizing, education, and preparation can help address inequities and threats. But without long-term investment in significant new or upgraded flood control infrastructure, residents already struggling with basic services may face higher flood risk as time goes on. 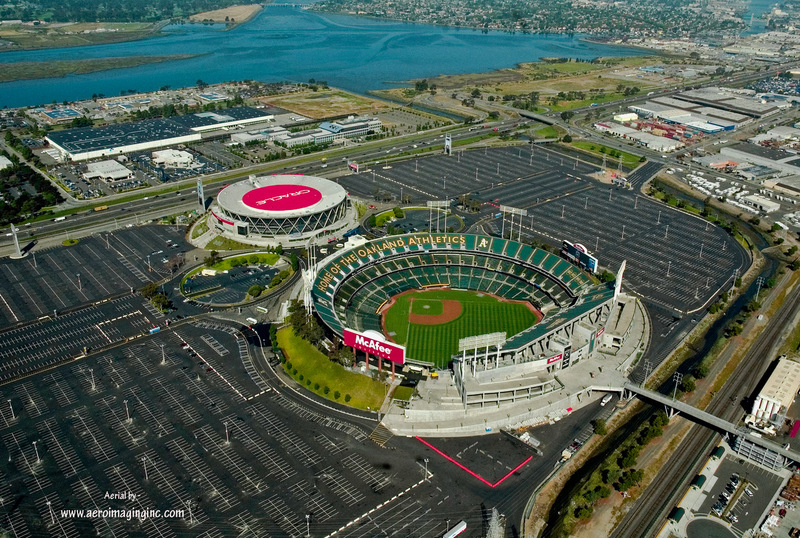 As the City of Oakland eyes redevelopment of the Coliseum area, the mammoth economic potential seems a perfect reason to strengthen flood protection for both transportation and the communities surrounding it. Price maintains a strong finger on East Oakland’s pulse through her position at East Oakland Collective. She has also interned for the City of Oakland and currently works for a city council member. Yet to her knowledge nobody has yet bothered to go to the neighborhoods and inform them of their vulnerability – let alone discuss solutions. Daniel Hamilton, the city of Oakland’s sustainability program manager, points out the city put forth a sea level rise preliminary resilience assessment in 2016 and developed a sea level rise road map in 2017, both of which included engagement with community organizations and members. Larry Gallegos, the City of Oakland’s Area Manager, notes that as required by the state environmental laws, the development of a specific area plan for the Coliseum Area in 2015 included numerous public meetings and workshops with communities. These provided an opportunity for communities to indicate priorities such as affordable housing, local jobs, and additional green spaces, he says. According to Gallegos, the predicted a multi-billion dollar value of the redevelopment is already outdated. However, the profit margin isn’t the only thing that needs to be updated. 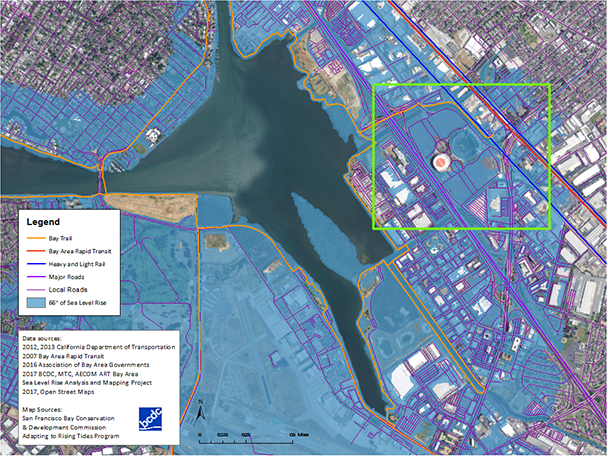 The Coliseum Area Specific Plan calls for new development to be designed for 16 inches of sea level rise in the near term, and consider a long-term adaptive approach for sea level rise up to 66 inches. 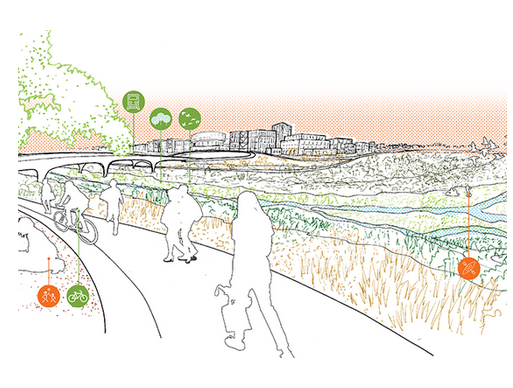 Though published a year after the MTC study, the plan does not address how combined flood events could result in more flooding much sooner around the slough. “Make It Yours” dialogue to discuss the community’s unique perspective of what makes Oakland, and what they wish to preserve. Photo: Amir Abdul-Shaku, Courtesy EOC. 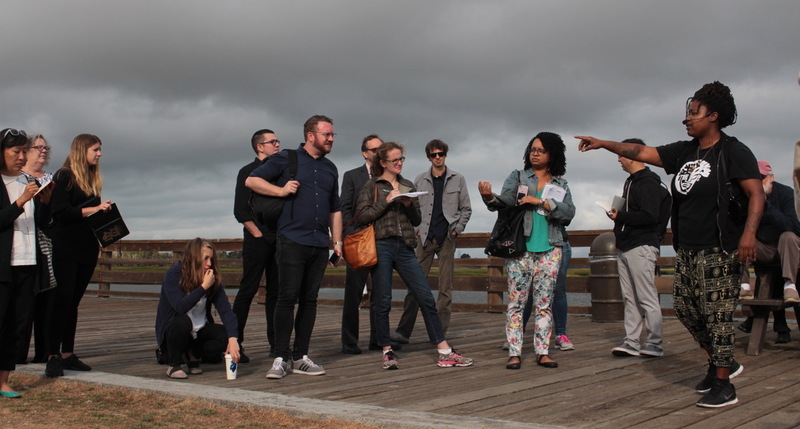 The East Oakland Collective is working with other local organizations to try and make sure the community’s concerns and voices are heard in the deluge of regional and local sea level rise discussions that ebb and flow around East Oakland. At their next collaborative “listening sessions” for the Havenscourt area, the Collective will be there to hear residents’ concerns about displacement, job opportunities, health and human services; and after that, share how climate change and sea level rise may impact the area. Amid the coming wave of water and gentrification, Price and her neighbors will resist and fight – until they are safe. But Oakland’s inequities will continue to rise, like Damon Slough, unless we all find a way to swim together. Thank you Acclimate and Isaac Pearlman. We need more reporting and analysis like this.to inform intelligent decision making in the face of future developments we know are inevitable.